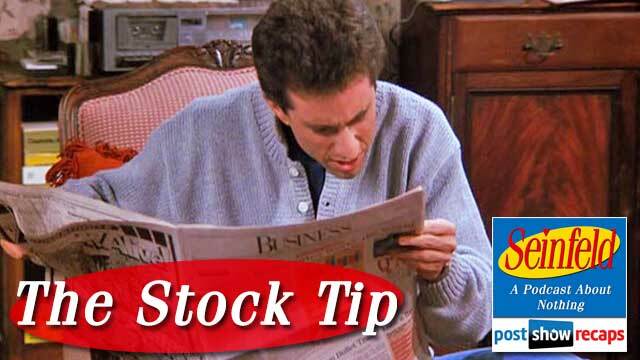 Rob Cesternino and Akiva Wienerkur recap the final episode of Season 1 of Seinfeld: “The Stock Tip”. In this episode Jerry and George both put $2,500 into the same stock based on the recommendation that George has gotten from a friend of his who knows the exact time to sell. As the stock plummets once Jerry and George are shareholders, George is unable to get a hold of his contact. Meanwhile, Jerry tries to take his relationship with Vanessa (from The Stakeout) to “Phase 2”. Against George’s recommendation, Jerry takes Vanessa away and has a terrible weekend in Vermont. Jerry finally decides to sell the stock before it goes up 6 points earning George a lot of money. Does Superman actually have a sense of humor? Is George or Jerry right about this debate? Why does Elaine have such an issue with cruelty to animals in these early episodes considering some of the stances she takes against animals in future seasons? How did a Seinfeld episode end with George being the big winner? Why was Kramer filled with glee as Jerry’s stock continued to go down? What are some of the reasons that Vanessa would not disclose what perfume she was wearing? Join us next week when Rob and Akiva discuss the final Seinfeld episode from the first episode of the second season of Seinfeld: “The Ex-Girlfriend”. Please let us know what you thought about the episode in the comments and whether you’d like to see the Seinfeld podcast cover the top 25 episodes or the entire Seinfeld catalog.